Pling. 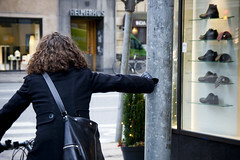 All of sudden this little bicycle-friendly detail showed up on the urban landscape in Copenhagen one day. I'm quite sure that very few people have noticed it, except for the people who roll up next to it. Which is the point, really. I'm talking about the railings that the man is holding onto and resting his foot on. It's located on a little traffic island on which cyclists who are heading straight on wait. 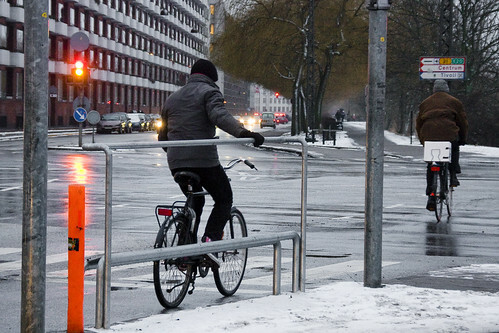 The City of Copenhagen has implemented this double railing simply as a convenience for the cyclists who stop here. A high railing to grasp with your hand and a foot railing for putting your foot up, if that's what you fancy doing. Either way you can also use the railing to push off when the light changes. 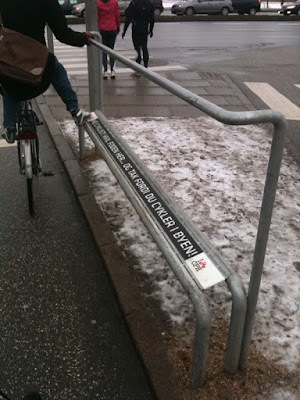 The foot rest reads: "Hi, cyclist! Rest your foot here... and thank you for cycling in the city." Another example of the city using the 'Hi, cyclist!' behavourial campaign/communications template that I developed for them. It's a tiny detail. No bells and whistles, just a simple idea to make a tiny fraction of the day a little bit easier for a small percentage of the cycling citizens of the city. Which is precisely why it's brilliant. This may not be a direct example of a 'Desire Line', but it certainly is a fine example of the City understanding human behaviour and basic anthropology. 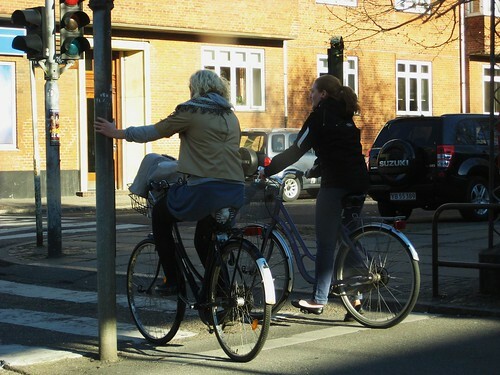 When riding about in schools of Copenhagen cyclists and rolling up to a red light, the cyclists along the curb will all wait with a foot on the curb. 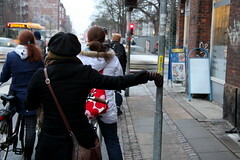 If there is a traffic light post close enough to the sidewalk there will, as a rule, be a hand resting on it and holding the person in question up. 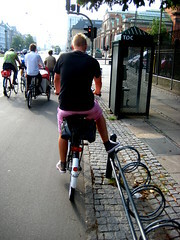 Why not spoil a few cyclists with a fantastically cheap and practical idea? A couple of metal railings. Slap 'em up. Make a few hundred cyclists a day feel loved. Fair enough, it's not a solution that can be implemented at every intersection. Nobody wants metal railings all over town. But find a place where they work and just do it. At some other intersection, perhaps another idea will fit perfectly. 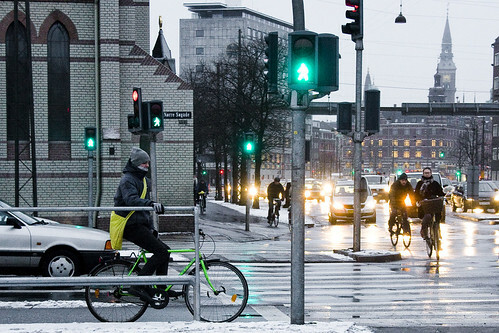 Actually, if you cycle about in Copenhagen take a look at the light posts next to where cyclists wait for lights to change, you'll see a tiny anthropological detail. I called it Bicycle Culture Buddhas. The metal is rubbed smooth on precisely one side of the post from all the cyclists' hands that lean up against it. Just like the tummies of so many Buddhas.